I had a long chat with Sam Glover on the Lawyerist podcast a few weeks ago and it’s going live today! Have a listen to hear us talk about PACER fees, open legal data, the PACER lawsuit, and the challenges of running an open data non-profit like Free Law Project. The Integrated Database provided by the Federal Judicial Center is one of the best-kept secrets in the world of legal information. Updated quarterly, it has metadata about every case in PACER (and many that are not), including civil, criminal, and bankruptcy cases. If the case is in PACER, this is often the only way to get in-depth metadata about it short of carefully reading the docket. The IDB is a treasure trove of data for researchers, litigants, and the public. We are proud to share that we have begun integrating the IDB into our dockets on CourtListener. This is the first time we know of that the IDB data has been united with data from PACER data in an easily accessible way. This project was made possible through generous support from one of our sponsors. This year we hosted legal documents from the most important cases in the country. Many of these documents are of historical significance, like the sentencing memos for Michael Flynn, Trump’s National Security Advisor, and Michael Cohen, Trump’s personal lawyer. Others are less important, but still popular, like the SEC taking Elon Musk to task for making materially false statements about Tesla. Whatever the case though, without exception, the top ten downloaded documents have to do, in one form or another, with either Tesla or Trump. This is a fax in Russian and English from the “Ministry of Justice of the Russian Federation” claiming immunity from the lawsuit. A few weeks ago I had the privilege and the pleasure of speaking at the Michigan Association of Law Librarians (MichALL) annual conference. The talk I gave was an overview of Free Law Project and all of our projects, initiatives, and advocacy. Here are the slides from that presentation. 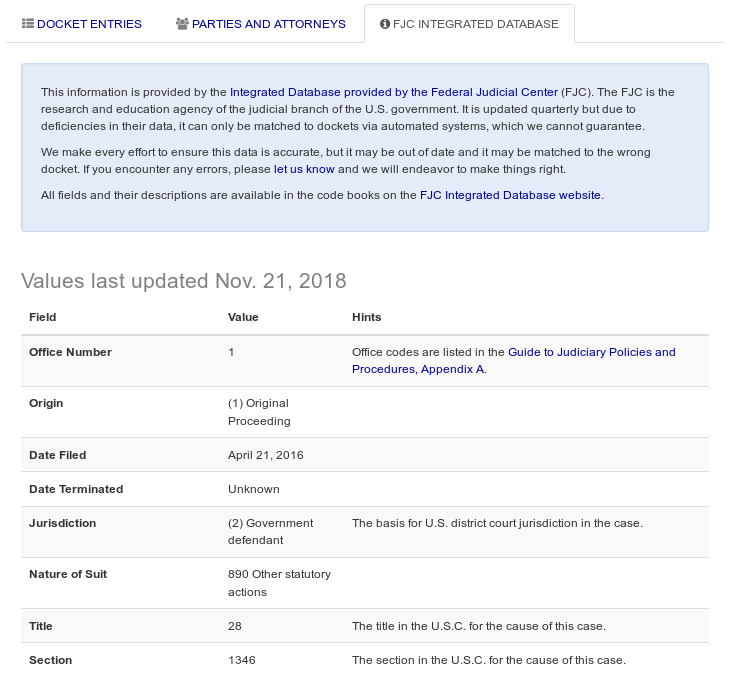 PACER/ECF is a system of 204 websites that is run by the Administrative Office of the Courts (AO) for the management of federal court documents. The main function of PACER/ECF is for lawyers and the public to upload and download court documents such as briefs, memos, orders, and opinions. In February we reported that we disclosed a major vulnerability in PACER/ECF to the AO. The proof of concept and disclosure/resolution timeline are available here. We are pleased to share that this issue is now properly addressed, and that we are now able to report more details about it. Throughout the process of researching, disclosing, and resolving this vulnerability, the AO has been prompt and professional, something that we greatly appreciate given the considerable constraints and complexities they are facing. However, despite their skill in dealing with this issue, after discovering it we have lingering concerns about the security of PACER/ECF on the whole. Today, we’re celebrating another milestone. We now have more than a million minutes of oral argument audio in CourtListener.com’s oral argument archive. All of this audio is available in our search engine, APIs, podcasts, and our website. A million minutes of oral argument audio is a lot, so it helps to contextualize it. This is nearly 700 days of continuous oral argument audio from nearly thirty thousand cases. Put another way, listening to this entire collection would take as long as watching every episode of The Simpsons 76 times. We have had a lot of success with our oral argument archive, and we’re thrilled to be able to provide it at no cost, despite its size growing every day. In the coming months we will continue expanding this collection in two key ways. First, we plan to begin automatically generating transcripts for audio files so that you can get an email alert any time certain words are said in court. Second, we plan to continue expanding our coverage so that it includes more state courts, and so that it includes all of the federal courts that have recordings available. Today, the PACER system contains millions of court filings for the federal district, circuit, and bankruptcy courts, most of which are sold at a dime per page with a three dollar cap per document. But content in PACER was not always priced this way, and indeed the PACER system goes back all the way to the early 1990’s, before computers were generally connected to the Internet. 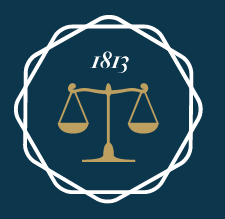 Fees for using PACER are set by the Judicial Conference of the Administrative Office of the Courts, which scrupulously keeps notes from its bi-annual proceedings going back to its creation in 1922. In this post, we have gone through all of the relevant proceedings, and we present what we believe is a complete history of PACER fees and changes. During the 27 year history outlined below, technology has changed significantly, and the Administrative Office of the Courts has done its best to keep up. Over the years, PACER has offered a variety of ways to get court information. These include a 1-900 number, a search service available via a regular phone call, the ability to connect your own computer directly to the courts’, and the websites that we know today. We have a small update to share today, as we’ve wrapped up adding thousands of historical Supreme Court citations to our collection. These are the original citations for the Supreme Court from 1754 to 1874, from before when the United States Reports had begun. Previously we had many of these citations, but as of today we can say we have historical citations for our entire SCOTUS collection. A snapshot of 18 Stat. 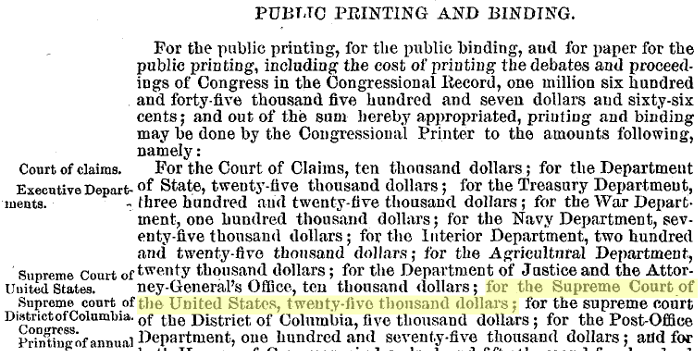 204 (1874), which allocated $25,000 to the Supreme Court for printing (about $557,100 today). Today we are launching party, attorney, and firm search for the RECAP Archive of PACER documents. This unlocks powerful new ways to do your research. Click any of the above queries to see how they were made. 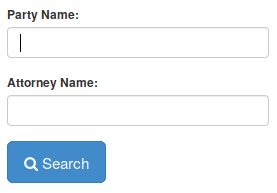 To use this new feature, type the name of the party or attorney into the fields on the RECAP Archive homepage or in the sidebar to the left of any search results. These boxes also accept advanced query syntax, and there are several new fields that can be queried from the main search box including party, attorney, and firm. For example, in the main box you can search for attorney:”eric holder”~2 firm:covington. This query shows the cases where the attorney has the word “Eric” within two words of “Holder” (thus allowing his middle name) which were handled at the firm “Covington & Burling”. Recently, as part of our routine business practices, we discovered what we believe is a major vulnerability in the PACER system of websites that we believe affects both the electronic case filing and public access portals. At this time, as part of a responsible disclosure process, we have notified the appropriate parties at The Administrative Office of the Courts, the agency that runs PACER. According to industry norms, we have given them a broad 90 day window to resolve the vulnerability. After the 90 days are up or the issue is resolved, we plan to publish the details of what we discovered, the ramifications of the discovery, and the solution that they have put in place, if any. Further questions about the vulnerability can be directed to our contact form where you can find our GPG key, if needed. As with all of the opinions on CourtListener, we have completed OCR on these opinions, and their contents are immediately available for search, bulk download, and via our APIs. 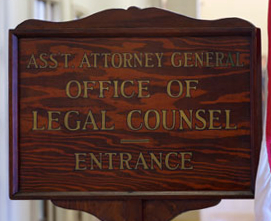 Free Law Project is proud to include these in CourtListener.com’s collection of over 1,000 Attorney General advisory opinions, making it the most complete collection of Attorney General advisory opinions available. We’re proud to share that we’ve now linked together our database of judges and our database of oral argument recordings. This means that as of now if you look at the profile page for a judge, you may see a list of oral argument recordings for cases that judge heard. Ginsburg has participated in hundreds of oral arguments that we have in our system. 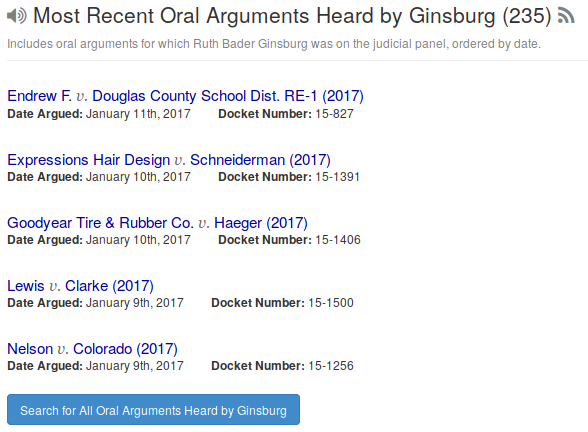 Clicking on the button at the bottom takes you back to our database of oral argument recordings where you can further refine your search. If the judge is active, there is an icon in the upper right that lets you subscribe to a podcast of the cases heard by that judge. At this time, these features are only available for the Supreme Court and for jurisdictions where the judges for specific cases are provided by the court website. We hope to expand this in the future. We're honored and humbled to get a Le Hackie award last night from @DCLegalHackers for our PACER research! Wish we could have been there! How Much Money Does PACER Make? The Cost of PACER Data? Around One Billion Dollars. What is a “Page” of PACER Content? D.C. Legal Hackers is an amazing group, and we’re really proud to get this award from them.